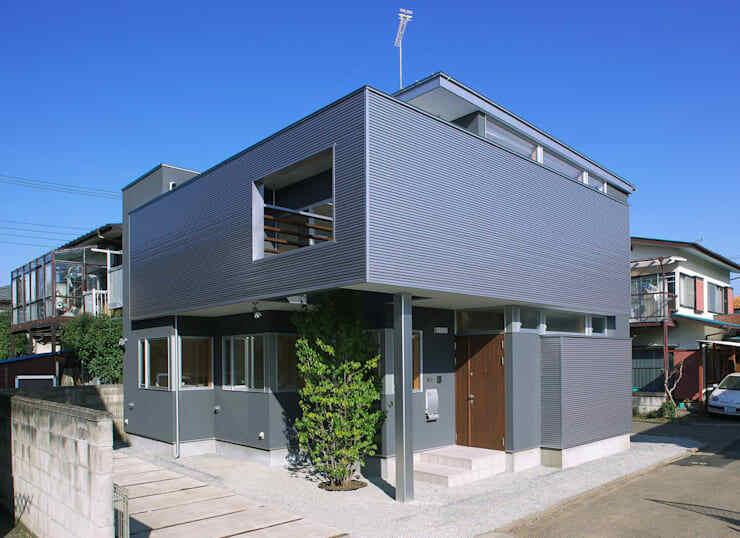 Today on homify we are heading to the tiny yet impressive island nation of Japan. Situated in a dense urban landscape, we are privileged to tour an interesting and individual abode. Conceived by the astute team at Studio Poh, this single-family dwelling boasts engaging and warm interiors, surrounded by a striking metallic cube façade. Not your ordinary family residence, this property stands out from the neighbouring architectural vernacular with its strong lines, angles and visually engaging form. On the ground floor sits functional workspaces, while the upper storey boasts the living space, kitchen and terrace. Peeking out from the square façade cut out, the terrace enjoys scenic views over the district. Light-filled and eye-catching, the architects have worked to provide privacy, while ensuring the home doesn’t lose its sense of engagement with the community. Intimidating and impressive, the façade of this cubist dwelling is definitely a standout for the neighbourhood. Opting for a modernist approach, the architects have incorporated a sense of tradition, while incorporating timber to soften the home’s visual impact. One of the first things we notice is definitely the steel fascia, which attracts attention within this quiet residential suburb. A driveway is situated to the side of the home, providing a space for a vehicle, which is often a prized addition in dense suburban living. As we head closer to the entrance of the home, we see that the opening to the terrace area above is actually a void space, built to allow the tree below to grow upwards and within. The use of lush vegetation softens the overall metallic appearance of the home, and reflects the timber that has been employed within the dwelling. As there is no real garden space as such, the use of this tree will help the dwelling connect to nature, and boost an organic ambience and atmosphere. As the tree grows within the cube cut out, and up towards the sky, the terrace will enjoy a shaded space, and the vegetation that comes with it. 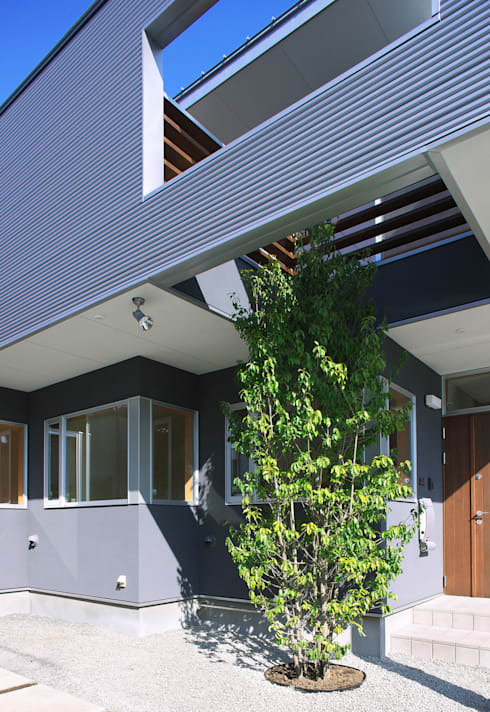 The timber front door can be seen to the right, and works beautifully in conjunction with the green tree, and juxtaposed against the metal fascia. As we enter the home, we head straight upstairs to the open-plan living quarters and kitchen. Here the house exudes a very different ambience to the one we saw curbside. As the bedrooms are on the ground floor, the upper level feels roomy and spatially unimpeded. Private and secluded, large windows and glazed doors have been added to the terrace side, while high windows were employed on the other street-facing sides. This helps boost privacy, and blocking any peering or nosey neighbours. From the opposite perspective we see the large terrace, which spans the entire length of the room. Perfect for lounging in the afternoon sun, or hosting a fabulous event with friends, the dwelling is open, spacious and wonderfully arranged. At the end of the room we see the kitchen, which appears to sit on its own, against the back wall, yet jutting out into the living space. This means individuals can utilise the cooking area as a socialisation space, and chairs can be added to the dining table-esque island. 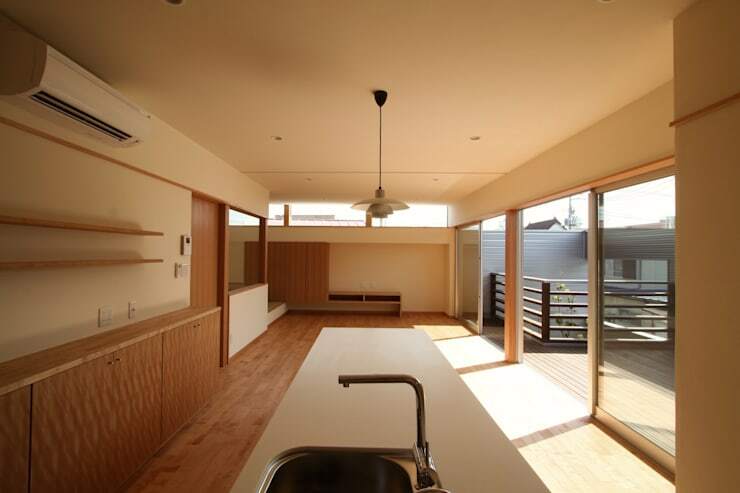 As we mentioned, the interior of this home differs considerably to the exterior of the dwelling. The outside is stark and minimal, with grey steel and a stoic sense of rigidity, while the interior is warm, welcoming and homey. The colour scheme is a soft cream hue, which pairs beautifully with the timber tones and textures seen throughout. The timber floor helps bring a sense of softness to the large, open plan space, while interior glazing offers movement of both light and sight. 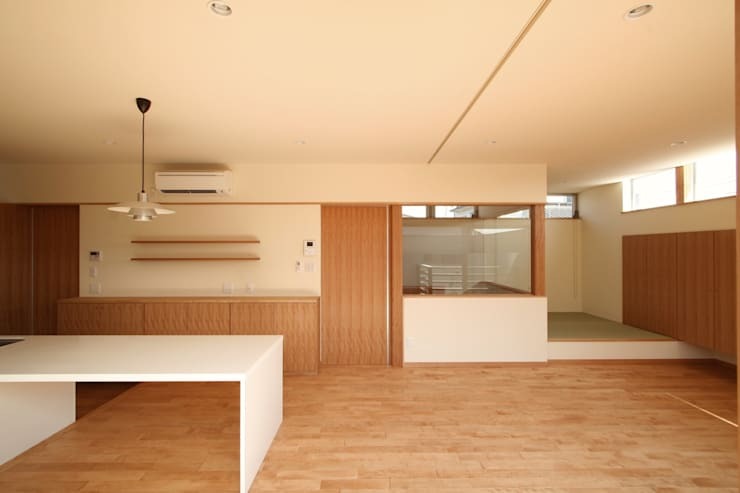 A tatami mat room can be seen in the far right, offering yet another texture, and a nod to traditional forms of living and construction. Lastly, we head back downstairs to take a final peek inside one of the front rooms of the home. 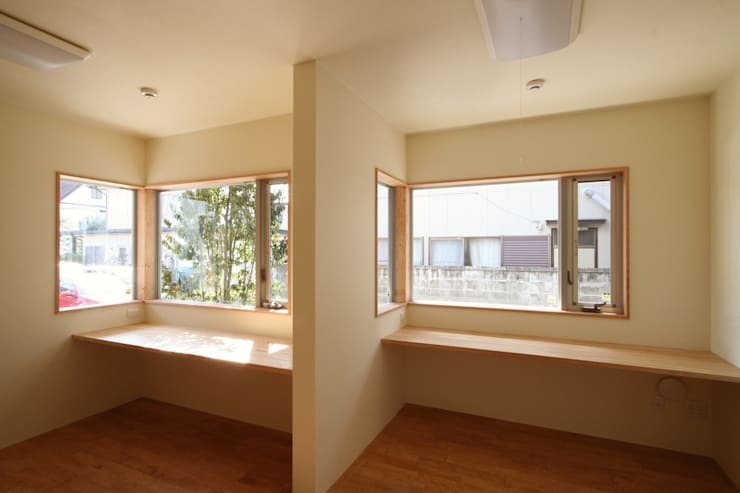 It is here that we see two study nooks, with built-in timber desks. The windows wind around the corners of the house, and are positioned to maximise and allow ample natural illumination. Practical, efficient and surprisingly welcoming, this simple home shows us how clever design can overcome spatial challenges, resulting in a highly desirable residence that will endure for years to come. 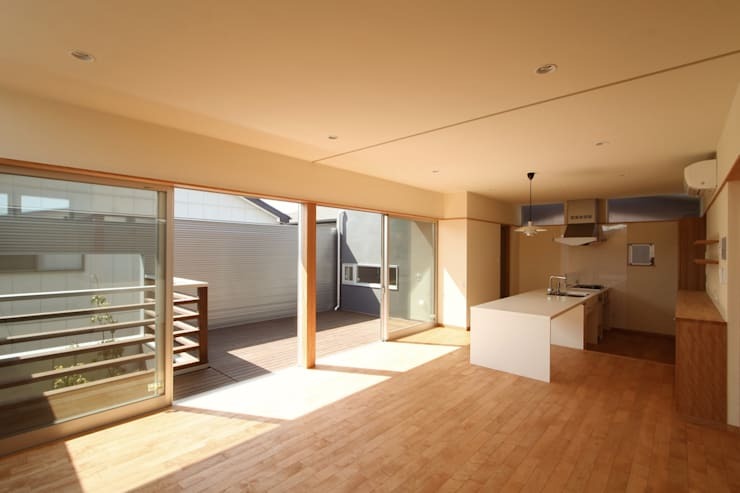 Would you like to tour another Japanese dwelling? Check out: A compact city home you'll fall in love with and keep reading! Would you like to live here? Let us know!